The aluminum solar road stud is widely applied in our daily life, and it is preferred by a large number of clients who need solar traffic facilities. The aluminum solar road stud is composed by the cast aluminum shell of the stud, solar panel, LEDs, battery and controller. For most of the solar road stud, the solar panel is just on the top surface of the stud itself, and it can absorb solar energy from all angles, and the receiving area is larger, which can absorb more solar energy and finish the charge process in short period. 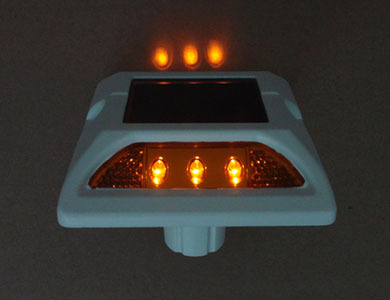 The LEDs can be on two sides of the solar road stud or on four sides of the stud, and the color of the LEDs can be different according to the needs of the clients. The colorful solar road stud at night can be a unique decoration in cities. Compared with other solar road stud, the aluminum solar road stud has strong pressure resistance, so it can resist crashes and it can work for 3 to 5 years if it is installed properly. 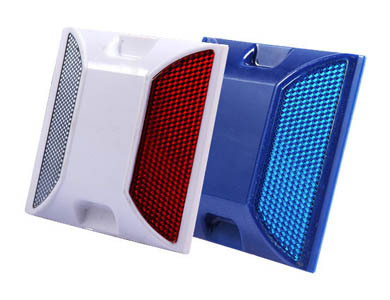 The LEDs on it can give out strong light, and the visual distance can be over 800 meters at night, which can avoid the happening of traffic accidents effectively. The working pattern of the solar road stud can be changed to Constantly ON or Flashing according to the needs of the clients. The aluminum solar road stud produced by NOKIN TRAFFIC FACILITY is favored by clients all over the world, such as the NK-RS-A1 and NK-RS-D1. NOKIN can provide customized service to all the clients to produce unique road studs products. We have our own laboratory, and all the products are tested strictly in accordance with the global standards in this industry. You can e-mail us to ask for the catalogues.